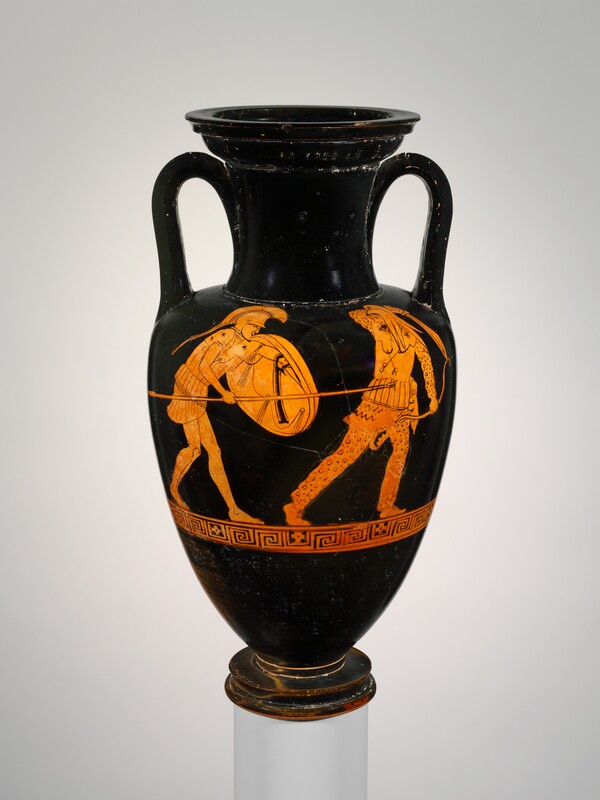 The Terracotta Nolan Amphora depicts two Greek soldiers killing a Persian soldier. 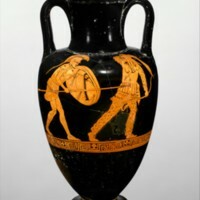 On the front of the amphora, there is a Greek soldier in a strong, athletic position impaling the barbaric-looking Persian through the stomach while the Persian flails his arms in the air, displaying vulnerability. 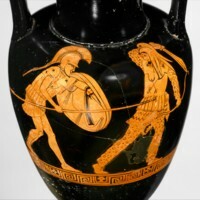 On the back-side of the amphora, there is another Greek soldier with his back to the viewer. This second soldier is depicted with a muscular physique, and winding up to do the same to the Persian. At only about 13 inches, it is quite small for an amphora, so it was probably used decoratively, not functionally. 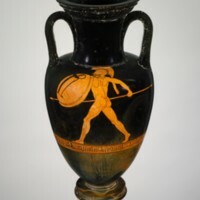 It is made from terracotta, a popular medium used in ancient Greece, and was decorated using red-figure technique, which means that the image is the same color as the terracotta used to make the amphora while the rest is colored black with a glaze. 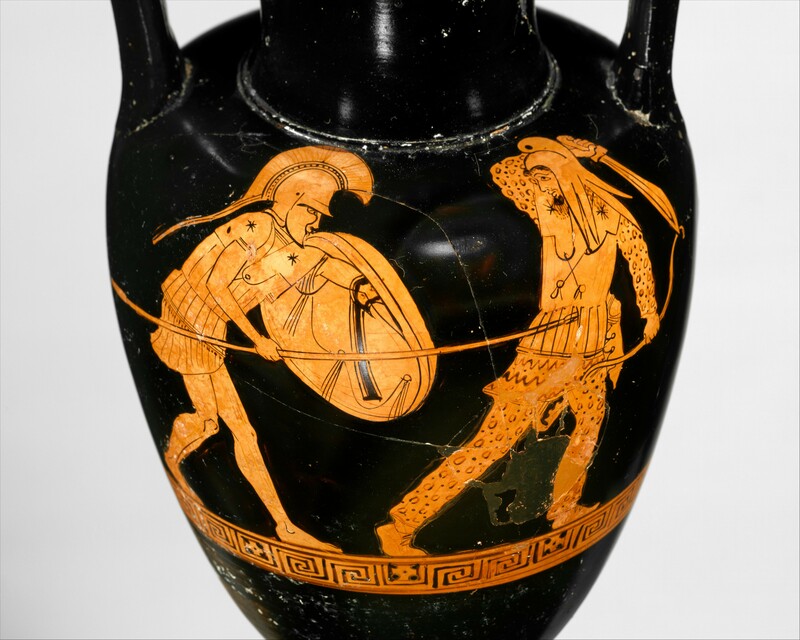 The amphora has a great deal of historical importance and context because it depicts a scene from the Greco-Persian Wars in which the Greeks fended off the Persians in both of their attempts at invasion. 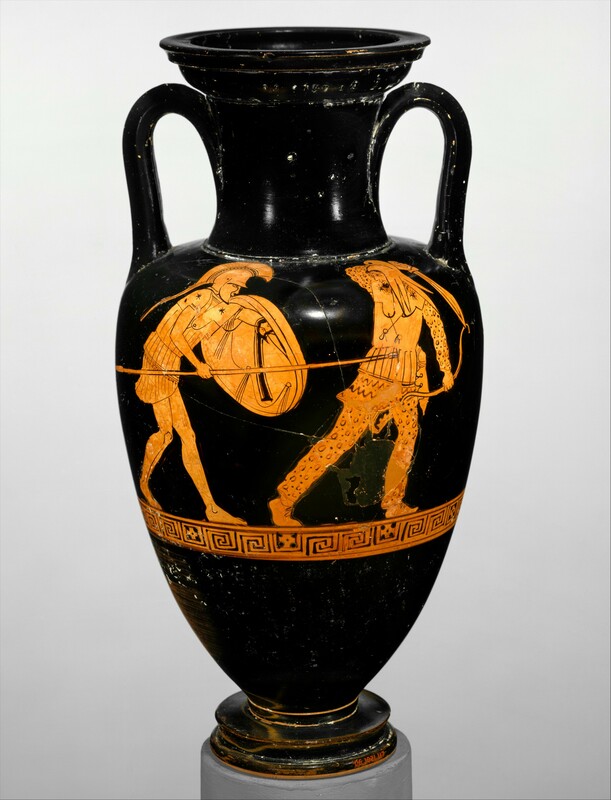 The Greeks rarely depicted contemporary battle scenes on their amphorae, so the fact that they did so in this piece shows that the Greco-Persian war was of particular importance to them. 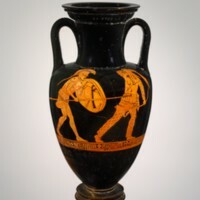 This piece should be added to our textbook because it would be the only amphora in the collection that depicts a scene from an actual historical event. A work seen in Janson’s History of Art that the Terracotta Nolan Amphora could very well supplement is Achilles and Ajax Playing Dice (fig. 5.25) by Exekias. This piece is another example of red-figure pottery. Despite the two pieces both being from the same era, they have some key differences. Achilles and Ajax Playing Dice is almost twice as tall as our Terracotta Nolan Amphora at 21 ⅞ inches, and shaped much differently, as its mouth and neck are much wider. It depicts a mythical scene, like the other amphorae in the textbook. Including the Terracotta Nolan Amphora in the textbook would disrupt this monotony. 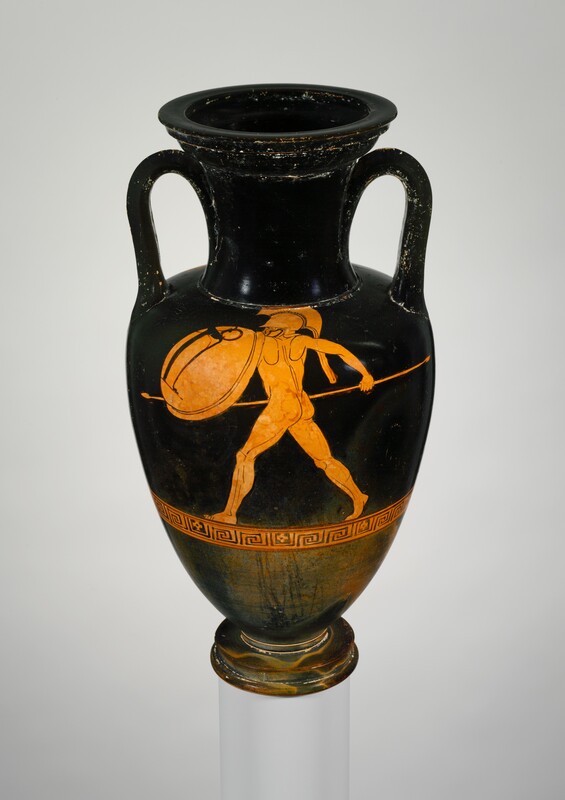 “Terracotta Nolan Amphora (jar),” accessed April 22, 2019, http://metsurvey.kenyoncip.org/items/show/55.